xkcd author Randall Munroe speaks to an audience in 26-100. The web comic artist visited on December 17 to answer questions and sign copies of his new book. The Institute-Wide Planning Task Force released its final report on December 16 after nine months of collaboration among approximately 200 students, faculty, administration, and staff within the task force. The 88-page document, which was originally scheduled to be released in November, compiles the reports from nine Working Groups and organizes them into five themes. 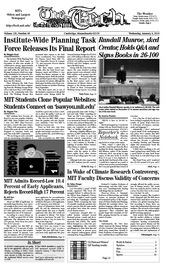 MIT students have become addicted to two new popular websites, MIT FML (http://mitfml.com/) and I Saw You MIT (http://isawyou.mit.edu/), created this past semester. Filled with anonymous, quirky, Twitter-like posts the two sites were designed to entertain, bond, and poke fun at the MIT community. About one fifth of applicants, an unusually large fraction, were rejected outright in this year’s early admissions cycle, which saw a record-high of 5,684 applications and a record-low admission rate of 10.4 percent. Campus Life was not published this issue.